Since I, like many of my fellow videolamer staff, now have a DS Lite, I am enjoying many new and interesting games. It even has backwards compatibility, making my GBA titles more vibrant and colorful than ever. But I was left with a small pang of sadness when I noticed that the original Game Boy games – as had been reported – simply don’t fit into the GBA slot. This isn’t so much of a surprise, although I had been keeping up hope. And so, I must bid farewell to my old portable games. They kept me engaged through even the longest road trips when I was younger, and I will now move on to newer, more colorful and touch-friendly games. The original Game Boy somewhat resembles a grey brick. It’s large and quite heavy by today’s standards. It takes four AA batteries and doesn’t last very long on them. The screen is consistently an unpleasant green color and any scrolling will blur the graphics, making most action games annoying to play. Despite all this, the system is commonly held up as the ultimate example of Nintendo’s craftsmanship. I recall reading about Game Boys surviving fires and floods. I’ve seen them dropped onto solid concrete several times and have only a few minor speaker issues. But as nice as the survivability of the system is, it’s more important to have good games, right? Unfortunately, there weren’t a whole lot of them. The majority of good games were made by one of two companies: Nintendo or Square. Wario looks really odd without his hat. The original Super Mario Land is a pretty good game, but I found it a bit too short. Super Mario Land 2 is considerably longer and more interesting – not to mention, it was our introduction to the character of Wario. The addition of special caps – an idea used later in the Wario Land series and in Mario 64 – gave the power-up system a bit more complexity, making the game somewhat better for road trips. Wario Land (or SML3), however, is the best of the series. 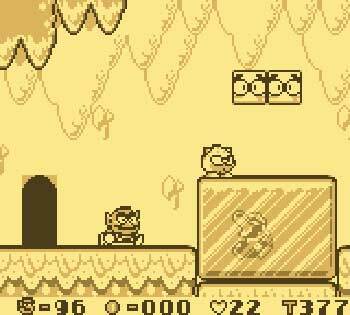 SML2 has some secrets, but Wario Land has a hidden jewel in every second or third stage. The more of these you get, the better a castle you are able to buy in the end. Sure, it only affects the ending, but I recall with fondness acquiring for him every jewel Wario can get his grubby hands on. Playing the anti-hero was an interesting feature, as we see Mario being particularly frustrating to Wario near the ending sequence. Another interesting Nintendo entry is the Donkey Kong game. Although arguably just a more complicated Donkey Kong, this game has you chasing DK through dozens of stages, using several of Mario’s special abilities with a control complexity that’s pretty amazing for two buttons and a D-pad. Varied environments and several particularly tricky puzzles make this puzzle-platformer a great game. It can be frustrating from time to time, but it’s long enough that this fact can usually be ignored. One of the features of note for Donkey Kong is its connectivity with the Super Game Boy. I never bought the thing myself – finding console games much more entertaining – but it’s an interesting idea. This idea was continued in the Gamecube GBA player. It may not have caught on at the time, but it should be interesting to see what happens with any DS-Wii connectivity. Of course, how could there be a Game Boy article that doesn’t mention Tetris? Since it was packaged with the original Game Boy, it’s hard to imagine having a Game Boy without having a copy of Tetris. There’s not that much to say about the Game Boy version. Tetris did not keep me engaged for too long, but I do remember playing it multiplayer with my family. The Game Boy had – perhaps surprisingly – some particularly good Action RPGs. Final Fantasy Adventure is the first entry in the Seiken Densetsu series (The “of Mana” series in the States. For anyone wondering why that knight in Secret of Mana had the weird name of Jema, the Gemma Knights are an order in FFA dedicated to protecting the Mana Tree). It’s a standard Action RPG, but it has a guest system in which you have a partner with you for most of the game. Sometimes they attack enemies at random, but almost all of them also have another purpose, such as healing your character, changing the music, or even selling you items. The variety of weapons you find adds to the flavor of the game. Axes chop down trees, sickles get rid of surrounding plants, and chain weapons let you cross certain pits. Each one also has a certain range and a special move which you can get by waiting for a power gauge to fill. Though its plot was somewhat cliched even when the game was released, the gameplay was solid. 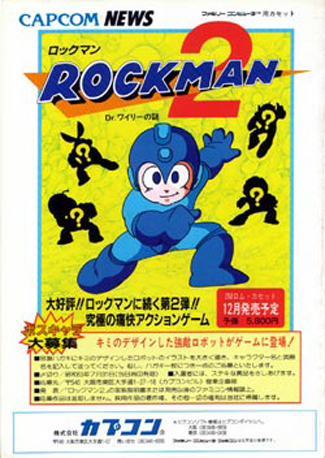 The ability to choose your character’s primary stat to increase with each level also lent some strategy to the game, and almost any “build” can beat the game. Particularly memorable part of FFA: The second-to-last boss battle is a personal favorite. It actually felt like you were dueling a person, while most boss battles were you against a big monster. Although it is a bit simpler, Rolan’s Curse II is a similar game. You have a party of up to four characters, chosen from several you meet on your adventure. Each character has a unique attack type, and most characters can get an upgrade by finishing their associated sub-quest. There is even a hidden character who’s a bit tricky to find. Since you can choose which characters you want to use, you choose your own play style. Music and art are very good and controls are very solid, which makes this game very enjoyable. There are two mechanics that bring down the game somewhat. First, characters level up by finding their “levels” in treasure chests scattered throughout the game. You can only get a character’s level if you have them in your party – otherwise a chest which would otherwise contain a level for that character will just have a small recovery item. The Final Fantasy Legend games, part of the SaGa series in Japan, were just about the only good RPGs. Though they are, as a whole, somewhat short and simplistic, they include some mechanics that are not widely used as well as generally interesting plots spanning multiple worlds. All of them have the benefit of Nobuo Uematsu’s composition skills. Final Fantasy Legend 1 is fairly freeform. You choose a starting character in the beginning; this is the only character you are stuck with for the entire game. The other three members of your party are whatever character types you choose. As they die, you can either revive them (which becomes expensive after a few deaths) or replace them with new characters from the adventurer’s guild. The tower – for which FFL was named in Japan – is a sort of world-tree affair. Your starting world is in the bottom, and three other worlds are located further up. As you progress, you find odd rooms in the tower: small paradises, miniature hells, even a world with only bizarre fish statues and a few treasures. All add a little bit of flavor to the game. The basic character types are human, mutant, and monster. Humans and mutants can be either male or female, with minor starting attribute differences. Humans grow through the use of special items that may be bought; mutants, on the other hand… mutate. Mutants randomly gain stat increases and special abilities after battle. Not all are favorable; a mutant can “gain” a weakness to fire, for example. Monsters can eat meat that enemies sometimes leave behind to morph into a new kind of monster. The variations available in selecting your party and the ability to choose the growth of any humans in your party gives FFL1 more customization than many RPGs of its time. The ability to switch out dead party members ensures that you don’t get stuck late in the game with a shoddy party; adventurers’ guilds later on give you somewhat better party members than earlier ones. Another interesting – or perhaps annoying – mechanic is the durability system. Any usable item you buy has a certain durability that decreases with each use. Long swords, for example, have 50 uses. Magic usually has from 10 to 30. Although it can be frustrating, it usually doesn’t cause that many problems, although by the fourth world you may be out of money. It’s not the best RPG around, but FFL is a pretty good game hampered by a few annoying quirks. I remember it particularly for the fourth major area: a post-apocalyptic world where a giant phoenix-monster roams a broken wasteland. Final Fantasy Legend 2 is more refined than the first game, and is the GB game I like the most. Some of the systems remain – item durability and the mutant system – but many features were overhauled to decrease frustration. You still choose your party at the beginning, but you are stuck with them for the entire game, so you should choose wisely. Some changes were made to the character system; humans gain stats or HP randomly at the end of battle. What stat increases is based on what item they used: broadswords increase strength, while rapiers increase agility and magic increases mana. The system works out much better than Final Fantasy 2’s somewhat similar system. The other change to the character system is the addition of robots. Robots have stats based on their equipment. For example, equip swords and axes to increase strength or shields to increase defense. Robots can also equip any amount of armor, and any equipment increases HP, making robots excellent meatshields. Mutants still gain stats randomly – more slowly than humans – but now you are actually told when they gain abilities, making them a bit less counterintuitive. The party system allows for a good variety of strategies, and only a few combinations are difficult to play – 4 monsters, for example, or 4 robots – but most are good fun and play differently from each other. The plot of FFL2 deserves particular mention. An old story says 77 magical talismans, or MAGI, were scattered throughout the worlds. Anyone who brings all of them together will have their wish granted. Your character’s father departs on an unknown journey, leaving you with a single MAGI. After a few years, your character decides to venture out and find him. As you progress, you pass through various worlds where some individuals have made themselves gods using MAGI, and (usually) kill them. Minor tweaks to the system make this game particularly fun. Your party can get guests who participate in battle, ranging from a cleric to a samurai to your character’s father. This kind of guest system, interestingly enough, was adapted for Final Fantasy XII. The ability to equip MAGI to each character is another interesting feature and allows for further specialization of characters. 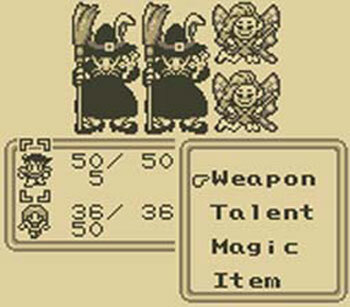 Unfortunately, the only really useful MAGI early in the game increases your base stats – it could have made for a more interesting system a la accessories in the main Final Fantasy series. As an RPG, FFL2 is a pretty good entry. Compared to other Game Boy games, it’s particularly good and has a depth that is uncommon. My favorite parts were your character’s various encounters with his father. Most RPGs have the cliche that the main character’s parents are dead. Meanwhile, in FFL2, your character’s father is both alive and powerful. These enemies don’t look very intimidating. 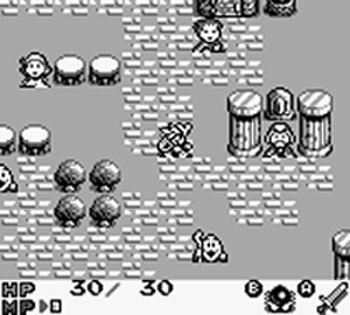 Perhaps closer to the “standard” RPG of its time, Final Fantasy Legend 3 was the final Square game for the Game Boy. It is almost entirely unlike the other games: it has set characters, uses a leveling system, and the plot involves time travel rather than multi-world exploration. Although it is a solid game, it is underwhelming compared to the relative innovation of FFL2. The system in FFL3 somewhat resembles the Dragon Quest formula or Final Fantasy IV. MP is used for spells, weapons and armor are equipped to slots rather than a freeform “inventory”, et cetera. The only significant resemblances to the other Legend games are the Guest system and the ability to make your characters into Monsters or Robots (neither of which are particularly useful). Character growth is done through a standard leveling system, and each character is relegated to a particular role. There are two fighters and two magicians – nothing particularly interesting otherwise. Three of your characters were sent to the past via a time-machine that appears to be present in each time. Naturally, you were sent to the past so that you would grow up to save the world. It was refreshing to see a plot like this that didn’t involve any prophecies, but the story is simply impossible to believe. Most of the time travel “events” don’t seem to be well crafted, so most of the events that would ordinarily be seen in a time travel-based game, such as seeing people when they are younger or older or seeing new towns form, are just not well carried-out. Most of them seem to be just references or unnecessary events that aren’t particularly interesting. There are even bad time travel jokes in the ending. Although the guest system makes its return, most of the guests are not as useful or interesting as they could’ve been. 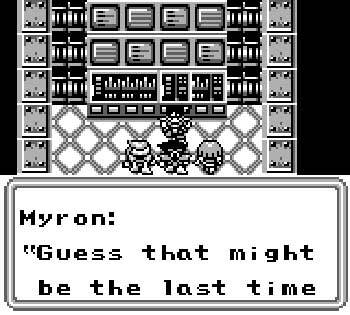 It may be the worst in the series – to my mind – but FFL3 was still better than the few other RPGs on the Game Boy. There weren’t any particularly interesting moments, although you do feel a bit of freedom when you can actually fly the Talon. The remakes of the Game Boy and the Game Boy Color also deserve some mention. The Game Boy Pocket got rid of the green tint on most games and fixed the blur when scrolling, while the Game Boy Color added colorization of old games and an entirely new game type. Game Boy Color games themselves were a relatively short-lived set. I never saw any games for the system I needed to have, and the only ones I actually played much were the Lufia game – a fairly derivative RPG – and the Dragon Warrior 3 remake, which was quite good but I still haven’t played much. To my knowledge, these are also impossible to play on the DS directly. And so I say goodbye to my old grey brick. Though I very rarely played it when at home, it was a great companion for many a road trip. Good night, sweet Game Boy, may flights of angels sing thee to thy rest! i actually had a friend in high school who loved Seiken Densetsu. i hadnt heard of it before or since, but maybe its worth checking out. and since you mention the durablility of that grey brick, there is a gameboy at the nintendo world store that was hit by something (napalm maybe?) during the gulf war. the casing is warped and discolored, but the damn thing still plays. that place is part museum, so if anyone is ever in midtown manhattan i recommend checking it out. The Zelda game was Oracle of Seasons I think and there may have been another one (or two). And I agree that the Legend games sound oddly good knowing the pedigree. The Saga series has to be one of my least favorite series since that series of warts I had on my foot. I’m not a fan of the PSX SaGa games, but the first two FFL games at least are enjoyable just because of the random worlds you visit. I do remember SaGa Frontier 2 being somewhat interesting, but I could only play Unlimited SaGa for about 20 minutes before shutting it off and never playing it again. The two Zelda GBC games were Oracle of Seasons & Oracle of Ages, developed mainly be the Capcom branch Flagship. They had a special connectivity feature (or gimmick) that allowed either game to be a ‘sequel’ of the other. The original GameBoy Zelda, Link’s Awakening, also had a re-do to GBC: Colorized with a few extra features.